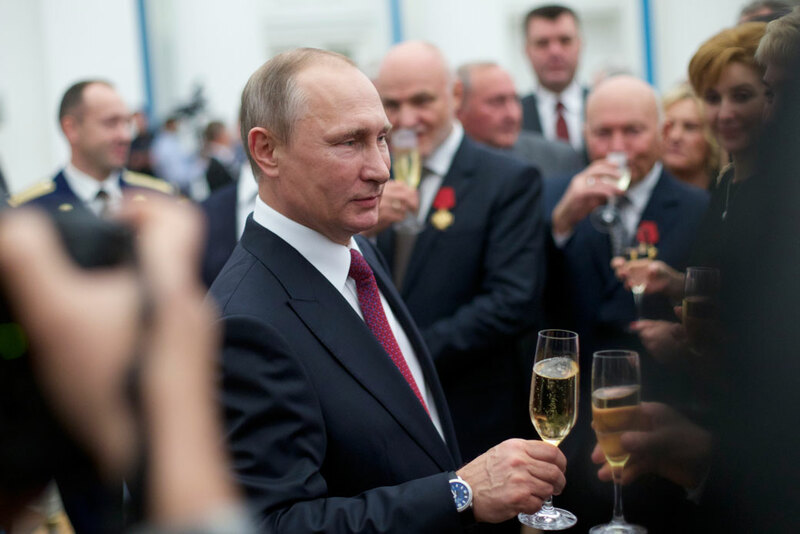 Russian President Vladimir Putin toasts during an awarding ceremony in Moscow's Kremlin, September 2016. President-elect Donald Trump’s shady web of connections to, and financial dependence upon, Russia’s often corrupt ruling elite. On October 16, 2016, the U.S. Director of National Intelligence James Clapper and Secretary of Homeland Security Jeh Johnson issued an extraordinary statement, indicating that the “U.S. Intelligence Community is confident that the Russian Government directed the recent compromises of e-mails from U.S. persons and institutions, including from U.S. political organizations.”1 The release of this hacked information was all directed at the Democratic presidential campaign and its affiliates, with no hacked information leaked regarding the campaign of the Republican presidential nominee, and now president-elect, Donald Trump. While historians may find Trump’s election notable for many different reasons, it is hard to believe that they will not focus first and foremost on the fact that a U.S. presidential candidate and then president-elect, when presented with clear and compelling evidence that Russia was trying to undermine U.S. democracy, openly embraced such un-American activities and their corrosive effects, going so far as to call upon Russia to release additional information about Clinton.13 Tested in the moment, Trump repeatedly put his self-interest ahead of the national interest. Moreover, an examination of the record suggests that this is far from the first time Trump has exhibited a bizarrely pro-Russia and pro-Putin predilection. Most troubling, it appears that his financial obligations and a shady web of Russian links suggest the true motives beyond his unacceptable behavior. The Russian hacking episode was far from an isolated incident nor the first time that Trump adopted a line that looked as though it was first crafted in the Kremlin. Indeed, a close examination of his statements makes it clear that Trump often sounds more like a paid lobbyist for Putin than a credible voice for America’s security. Many of Trump’s outlandish defenses of Putin, outlined below, easily cross the line from extremely naïve to genuinely dangerous. So how to explain Trump’s cartoonish defense of all things Russian and Putin? A closer look at the web of people and money that tie Trump to Putin and Russia’s often wildly corrupt ruling elite begins to provide an answer. President-elect Trump was not always reflexively pro-Russia, and the roots of his embrace of Moscow are relatively recent. And, like so much of his business career, Trump’s interest in Russia grew from financial desperation. During the 1990s, Trump found himself more than $4 billion in debt to more than 70 banks, and a series of bankruptcies, heavy financial losses, and debt restructuring lead almost all major American banks to simply refuse to do business with him.28 Consequently, beginning in the 2000s, he began to rely very heavily on foreign banks for his lending,29 and Russia—with its inner circle of wealthy oligarchs close to Putin and lax financial integrity laws—must have seemed like a cash cow to Trump. Tillerson also has had a close personal relationship for over a decade with Igor Sechin57—a former KGB agent and close Putin ally—who is the head of the Russian oil conglomerate Rosneft and also maintains an extensive network of current FSB links.58 Sechin is one of those individuals currently under direct sanction by the U.S. Treasury Department because of Russia’s illegal occupation of Ukraine.59 The U.S. Treasury Department has said that, “Sechin has shown utter loyalty to Vladimir Putin – a key component to his current standing.”60 Hardline anti-American Russian officials have celebrated Tillerson’s nomination.61 Tillerson was also the director of Bahamas-based Russian-U.S. oil firm Neftegas.62 And, when it comes to potential conflicts of interest, Tillerson’s are matched only by those of Trump himself. Although not specifically an issue with regard to Russia, as part of Trump’s transition team, Flynn has sat in on classified briefings, which may have violated ethics requirements, since he continued to consult for foreign clients at the same time.69 In addition, it was revealed that according to Defense Department documents, Flynn inappropriately shared classified military intelligence with foreign military personnel.70 Defense officials have disputed Flynn’s claim that he had permission to share the materials. An infamous political operative who was implicated in Richard Nixon’s Watergate scandal, Roger Stone, served as an adviser to the Trump campaign.83 He is also a former business partner to the aforementioned Paul Manafort. Stone repeatedly appeared to have advance knowledge of the timing and substance of the WikiLeaks hack releases designed to damage the Clinton campaign. Moreover, Stone admitted during the campaign that he had “communicated” with WikiLeaks founder Julian Assange.84 So, although less of an issue with regard to potential direct links to the Kremlin, Stone did appear quite eager to facilitate and promote WikiLeaks. Much of the focus on Trump’s slavish support of Putin suggests that it likely stems from his deep reliance on Russian finance propping up his often shaky real estate empire. However, those familiar with the hardball tactics of Russian intelligence agencies have also suggested that Trump may also be pressured due to damaging kompromat, or compromising information, gathered on him by the Russians during his trips to Moscow. The Guardian noted, “[T]he FSB may have videoed Trump inside the suite. There is no proof that any compromising video exists. But the FSB would certainly have been interested in this kind of stuff: this is, after all, what it does.”95 An anonymous former Western intelligence official indicated that he had shared with the FBI findings that the Russian intelligence services had compromised Trump after a long campaign to cultivate him for their own ends.96 The New York Times notes that a common Kompromat tactic is to ensnare politicians in sexually compromising positions.97 Perhaps the most notorious moment of Donald Trump’s campaign came as a result of the release of the now infamous “Access Hollywood” footage in which he crudely discussed grabbing women. Never before has a U.S. president appeared so deeply enmeshed and beholden to a foreign power whose interests are clearly hostile to our own. With Trump so clearly a champion of Putin’s Russia and continuing to deny the almost irrefutable evidence of Russian interference in the U.S. election, it is reasonable to ask what the quid pro quo between Putin and Trump will look like going forward. In many ways, Russia’s support and cultivation of Trump has already yielded benefits beyond Putin’s wildest dreams: a U.S. president skeptical of NATO; fond of spouting wild, unproven conspiracy theories; unwilling to even acknowledge deep Russian transgressions of international law and norms in Syria and Ukraine; as well as a penchant for appointing individuals to his cabinet with myriad ties to corrupt Russian oligarchs and current and former intelligence officials. An embrace of any of these policies will only further demonstrate the dangerous path that Trump is propelling the United States down. It will mark a period when it is impossible to determine whether major national security decisions are being made in the U.S. national interest or in the interests of Putin and the shadowy cabal of dark Russian money with which Trump has surrounded himself. President-elect Trump may have used an infusion of cash from Russian oligarchs to keep his frequently struggling real estate afloat. And he may have used his embrace of Putin’s authoritarianism to his short-term tactical gain, as he clearly benefitted from massive and unprecedented Russian interference in the U.S. election. Soon, Trump will be president, and it will be his job to serve as commander and chief to the U.S. armed forces and intelligence services. So whether or not President-elect Trump continues to willfully deny the findings from 17 U.S. intelligence agencies that Russia interfered in the U.S. election as he stocks his administration with pro-Putin loyalists or if he simply tries to downplay his past denials, several steps are vital to ensure that Trump does not continue to put Vladimir Putin’s interests ahead of America’s own. President-elect Trump must fulfil his long overdue commitment to release his tax returns. Without full tax returns, and not just summaries, it will be impossible to judge to what degree Trump and his children rely on Russian financing, have assets comingled with FSB-linked Russians, and the scope of what continue to be staggering conflicts of interests. A bipartisan national commission on foreign interference in U.S. elections must be established. There must be a full and proper investigation of the methods and reasons behind Russian interference in the election. This is far too important a topic to merely treat as regular committee business in Congress, where it would be all too easy for one party to sweep findings with which it disagrees under the rug. There must be full disclosure of foreign ties and potential conflicts by the president-elect and his nominees, with a focus on Russian entanglements. The necessity for full disclosure should not be limited to just Senate confirmable positions but rather any top Trump administration posts. For example, National Security Advisor-designate Michael Flynn should disclose the scope of his payments related to his attendance at the Russia Today gala with Putin as well as any other speaking or appearance fees or consulting contracts with Russian entities. President-elect Trump must fully divest himself from his business holdings and place them into a genuinely blind trust. Simply claiming not to engage in “new deals” or handing management of his businesses over to his children,103 even as they continue to be closely involved in government, leaves the United States open to corruption and foreign influence at the highest levels. America stands at a critical threshold, not only regarding its future—but also regarding the fate of modern democracies across the globe. Allowing a hostile foreign power to influence our elections or failing to deal with massive and unprecedented foreign financial conflicts of interest would abandon the very principles upon which our constitution was moored. Ben Schreckinger and Julia Ioffe, “Lobbyist Advised Trump Campaign While Promoting Russian Pipeline,” Politico, October 7, 2016, available at http://www.politico.com/story/2016/10/donald-trump-campaign-lobbyist-russian-pipeline-229264.